10:06pm ET: Boone corrected himself following tonight’s win. Loaisiga will start Friday, not Thursday. That’s when the Yankees were originally planning to use Tanaka’s replacement. Boone just misspoke before the game. 4:37pm ET: The Johnny Lasagna era is upon us. 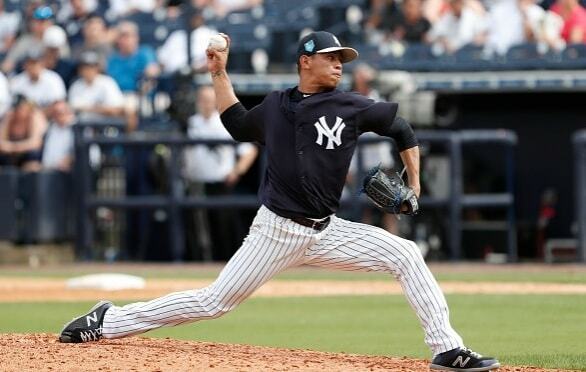 This afternoon Aaron Boone announced Jonathan Loaisiga is indeed being called up to replace Masahiro Tanaka. He’ll start Thursday, in the series opener against the Rays. That gives Domingo German and Luis Severino an extra day of rest before their next starts. Loaisiga, 23, owns a 3.00 ERA (2.32 ERA) with 31.9% strikeouts and 2.2% walks in 45 innings split between High-A Tampa and Double-A Trenton this season. He threw 49 pitches Saturday in what sure seemed like a tune-up start. Loaisiga, my No. 17 prospect, had thrown only 2.1 innings above the short season minor leagues prior to 2018. In yesterday’s poll, Loaisiga narrowly edged out Justus Sheffield as the preferred Tanaka replacement. The kid has made a meteoric rise since returning from Tommy John surgery last year, going from rookie ball to the 40-man roster to Double-A to the big leagues. Quite a year for Loaisiga. The Yankees will have to make a 25-man roster move to accommodate Loaisiga. Ronald Torreyes was called back up when Tanaka went on the disabled list, so I suppose he could be sent back down, though I wonder whether Tyler Austin will get optioned instead. He hasn’t hit much lately and Torreyes is more versatile. We’ll see.